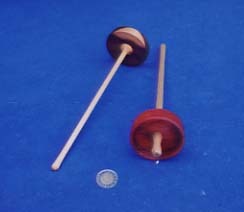 Posted on October 31, 2007	by Linda S.
On my Yahoo Spindlers group, there have been several questions re: finding a spindle maker in Canada so Canadian spindlers don’t have to pay the terrible excise taxes for bringing spindles from the US. Well, thought I would pass on what I found this morning.. a true, blue, dyed in the wool (pun intended..grin) Canadian spindle maker. This entry was posted in Handcraft, Handwork, Shops, Spinning. Bookmark the permalink.